Age-related increases in trabecular bone porosity, as seen in osteoporosis, not only affect the strength and stiffness, but also potentially the mechanobiological response of bone. The mechanical interaction between trabecular bone and bone marrow is one source of mechanobiological signaling, as many cell populations in marrow are mechanosensitive. However, measuring the mechanics of this interaction is difficult, due to the length scales and geometric complexity of trabecular bone. 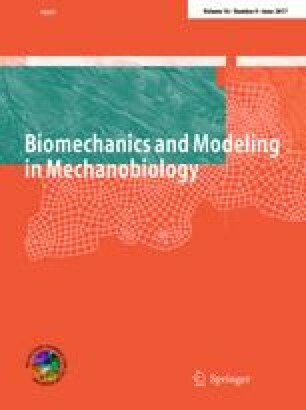 In this study, a multi-scale computational scheme incorporating high-resolution, tissue-level, fluid–structure interaction simulations with discrete cell-level models was applied to characterize the potential effects of trabecular porosity and marrow composition on marrow mechanobiology in human femoral bone. First, four tissue-level models with different volume fractions (BV/TV) were subjected to cyclic compression to determine the continuum level shear stress in the marrow. The calculated stress was applied to three detailed models incorporating individual cells and having differing adipocyte fractions. At the tissue level, compression of the bone along its principal mechanical axis induced shear stress in the marrow ranging from 2.0 to 5.6 Pa, which increased with bone volume fraction and strain rate. The shear stress was amplified at the cell level, with over 90% of non-adipocyte cells experiencing higher shear stress than the applied tissue-level stress. The maximum shear stress decreased by 20% when the adipocyte volume fraction (AVF) increased from 30%, as seen in young healthy marrow, to 45 or 60% AVF typically found in osteoporotic patients. The results suggest that increasing AVF has similar effects on the mechanobiological signaling in bone marrow as decreased volume fraction. This research was supported by the U.S. National Science Foundation (CMMI 1435467). Samples were collected through support of the U.S. National Institutes of Health Grant AR052008. TAM was supported by the Whitaker International Program. TJV/LMMc: European Research Council 258992 and the Royal Irish Academy Postdoctoral Mobility Scheme.